Remember when every YouTube video was plastered with multiple obnoxious annotations overlaying parts of the screen and beseeching you to click? Well, that era is finally drawing to its inevitable close. The video platform discontinued its annotations editor on May 2nd, 2017, and will stop showing any existing annotations on January 15th, 2019. This isn't much of a loss - annotations were never good - but it does mark the disappearance of a noteworthy part of YouTube's history. 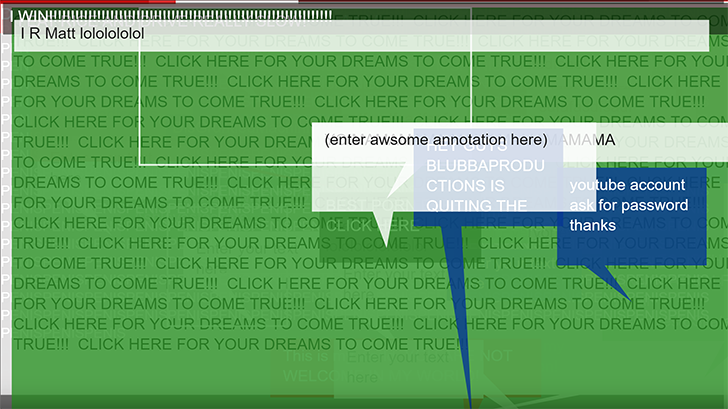 Annotations went live in 2008 and were immediately put to use by YouTube entertainers for selling merch and recommending new videos. While this may have been helpful from a business standpoint for the individual YouTuber, the notes added up to frustrating visual clutter for viewers, and weren't made with the platform's mobile future in mind. In 2016, YouTube launched end screens as a new interface for linking to videos and sites at the end of a video without using clunky workarounds that included annotations. The site also added cards, a tidier, less obtrusive pop-up option for mid-video text. After the advent of those two features, Google noted that the use of annotations had decreased by over 70 percent by early 2017, leading it to discontinue the annotations editor that spring. Now, we have the exact cut-off date for older annotations, so you can go watch your favorite old-school annotation-laden video now for a flashback to a simpler yet more cluttered time - or just let them die in peace.